British Arabian: Asset Valuers & Chartered Surveyors is a RICS Regulated asset valuation consultancy that offers a full range of valuation services to our clients. We specialise in the valuation of real estate and business assets across the Middle East and also in surrounding emerging markets, in particular Africa and Central Asia. We pride ourselves on being at the forefront of best practice. Five years ago, we were the first regional firm to commit to RICS Valuer Registration. We are one of only two GCC valuation companies that are listed as RICS Regulated. 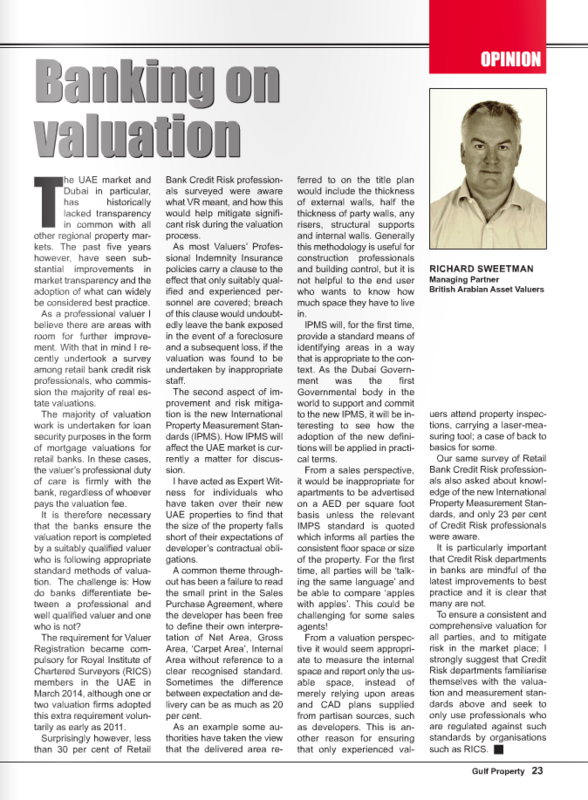 Our Managing Director sits on the RICS MENA Region Valuation Standards Board. Our simple philosophy is to create successful business relationships through the delivery of a professional and high quality service where the client’s needs are understood and, where possible, their expectations are exceeded. Our smallest client can expect the same service level as the largest.